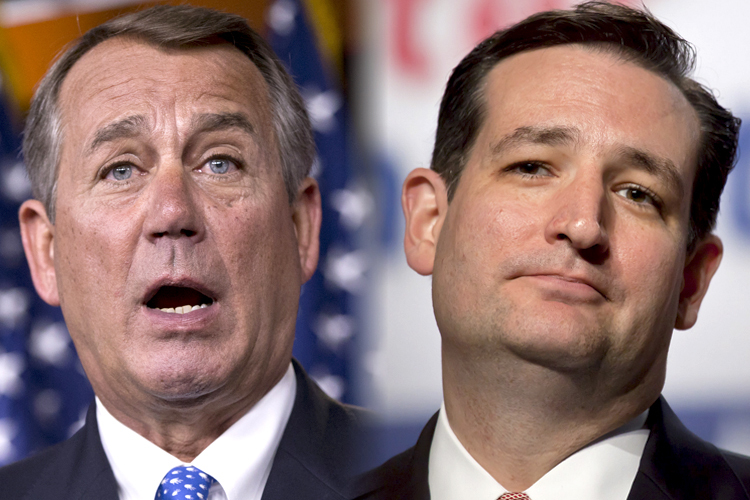 Movement Conservatives just claimed the head of House Speaker John Boehner. His political death was the price of preventing a catastrophic government shutdown after Movement Conservatives in Congress tied the very survival of the United States government to their determination to defund Planned Parenthood. Movement Conservatives are gunning for Senate Majority Leader Mitch McConnell next. We should be very afraid. Boehner and McConnell are not wild-eyed lefties. They are on the very far right of the American political spectrum: fervently pro-business, antiabortion, opposed to social welfare legislation. But they are old-school politicians who still have faith in the idea of American democracy. Movement Conservatives do not. They want to blow up the government and remake America according to their own radical ideology. Since the 1950s, Movement Conservatives have set out to destroy the form of federal government that came out of the New Deal. After the Great Crash and the ensuing Depression, most Americans believed that the government must regulate business and protect labor in order to create a stable, prosperous society. But businessmen hated the very same New Deal regulations most Americans liked. The captains of industry believed that government meddling in their affairs would disrupt economic laws. This would cripple their enterprises and, in turn, cripple the American economy. But the New Deal consensus was enormously popular, and actually made for a stable economy in which most Americans enjoyed security. Business interests could not fight this consensus on the merits, or they would continue to lose. In 1951, a young William F. Buckley, Jr., came up with a blueprint for destroying the American consensus. Rational argument was a losing strategy, Buckley wrote in “God and Man at Yale: The Superstitions of ‘Academic Freedom.’” If voters were presented with facts, said Buckley, they would choose government regulation. So a new breed of Movement Conservative leaders must start from the premise that what Buckley called “individualism”—that is, an economy in which individual action was untouched by the state—was as sacrosanct as the Ten Commandments. Buckley gave this same untouchable status to Christianity, another fundamental that could not be questioned. People could quibble about the details of society based on an unregulated economy and Christianity, he allowed, but those bedrock principles could not be compromised. Individualism and Christianity were under attack, he insisted, from New Deal apologists and secular thinkers who had wormed their way into all levels of government and education. The secular New Dealers, Buckley claimed, threatened America’s very survival. In the same year Buckley wrote “God and Man at Yale,” Eric Hoffer, a former San Francisco dockworker-turned-philosopher, examined the nature of authoritarian government. Having watched the rise of both fascism and communism, the former San Francisco dockworker thought those who wrung their hands over the ascent of a charismatic leader like Adolf Hitler or Joseph Stalin were missing the point. There could be no leader without a mass movement, Hoffer argued. His observations about how revolutionary leaders created followers were so compelling that when Dwight Eisenhower became president, he urged everyone to read Hoffer’s book, “The True Believer.” Eisenhower worried deeply about the rise of authoritarian governments. He worried about fascism, communism and religious extremism overseas, but he was also deeply concerned at the rise of Movement Conservatism in America. That movement looked dangerously like the ones Hoffer described. In the years since, Movement Conservatives have continued to follow Hoffer’s script. Mass movements ultimately need a disaffected population, Hoffer said, people who are either economically or culturally dispossessed. Those isolated individuals need to feel part of something bigger than themselves. They need to believe they can regain their previous relevance. Properly primed, such followers will throw themselves behind a leader who promises to return them to power. In the early stages of a mass movement, “men of words,” as Hoffer called them, primed the pump for revolution by discrediting the current order of society. They encouraged followers to despise the present as a terrible declension from a glorious past. Then came the men of action—political leaders. As society destabilized, these new leaders created an artificial reality that made their discontented followers feel like they were part of something bigger than them, a movement to save society, a movement so important it was worth sacrificing themselves for it. The easiest way to unify followers was with hate. Leaders of such a movement identified a villain. These villains were usually the weakest members of society, making them easy to attack. And each attack on these new “enemies” fed contempt for them. Followers of a movement made more and more outrageous claims about those they demonized. Eventually those villains became so dehumanized that movement members would kill them, believing such atrocities were vital to reclaiming a glorious future for their nation. At this stage, followers were immune to facts or logic. Indeed, arguing with them only entrenched them in their beliefs, because the sign of a true believer’s faith was that it stood firm in the face of overwhelming opposition. Eisenhower noted that early Movement Conservatives seemed to fit the pattern Hoffer’s work identified. In Eisenhower’s day, Movement Conservative leaders from William F. Buckley Jr. to Robert Welsh, who began the John Birch Society from his position at the Education Committee of the National Association of Manufacturers, harped on the idea that Communists had taken over the American government and were selling it out to an international cabal. Wisconsin Sen. Joseph McCarthy took that war into popular media. He claimed the need to defend individualism and Christianity from the secret plots of godless Communists in the government.